Senior Kayla Cleare finished with 10 points and six rebounds to push her over 1,000 points for her career and break the career rebounding record mark set by LaSheena Brown. 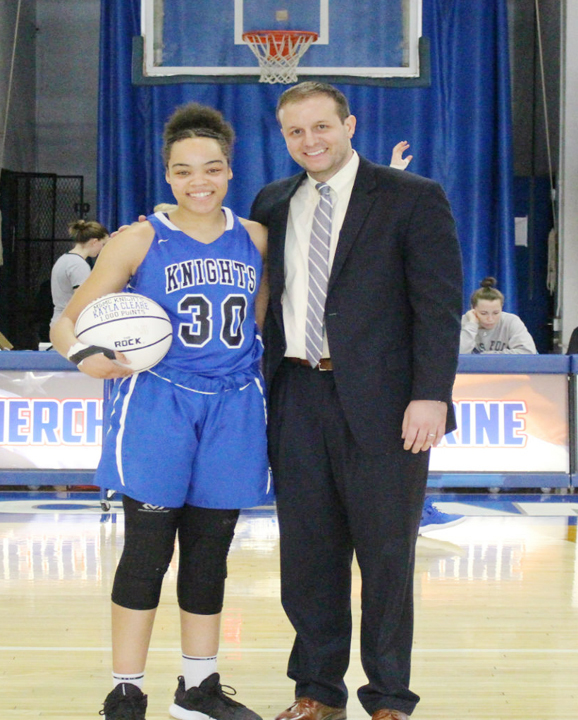 KINGS POINT – Senior Kayla Cleare finished with 10 points and six rebounds to push her over 1,000 points for her career and break the career rebounding record mark set by LaSheena Brown as the Mount Saint Mary College Women’s Basketball team won their fourth straight game over United States Merchant Marine Academy 57-47. The Knights got off to a 6-2 lead following four points from Katie Smith and two points from Cleare. Following a Taylor Hightower layup, the Mount ripped off a 9-2 run on five points, including a three-pointer, from Lauren Desrats to give the Knights an 18-11 lead following the first period. A Julia Dahlke three-pointer cut the lead to one point and another three by Kiana Vega put the Mariners on top for the first time in the contest. The Knights went on a 13-5 run, including Cleare’s 1,000 point with 2:16 remaining in the quarter, to give the Knights a 36-29 lead at the intermission. Desrats finished with 10 points in the first half, including two threes, and Smith and Cleare added eight points at the half. The Mount finished the half shooting 43.8-percent from the field and 42.9-percent from deep. USMMA shot the ball efficiently at 52.4-percent from the field and 50.0-percent from three. Merchant Marine knocked two more threes than the Mount while the Knights made three more free throws. Both teams struggled from the field in the third quarter, as Merchant Marine outscored the Mount 10-6. Lyndsay Pace knocked down two threes for the only points in the quarter. The Knights held a slim three point lead heading into the final stanza. The Knights started the fourth quarter on a 7-2 run behind four points from Smith and a three from Pace. After a Cleare layup made it a nine point advantage with 3:45 remaining in the quarter, a three-pointer from Dahlke and a layup from Kaleigh D’Arcy cut the lead to four with 2:49 to go in the contest. The Knights concluded the contest on a 6-0 run on buckets from Desrats, Smith and Maite Gritsko to finish the game with a 10 point victory. The Knights held the Mariners to 24.0-percent in the second half and finished the half shooting 31.0-percent from the field. Each team knocked down three triples and Merchant Marine had three free throws made in the half. Pace led the way in the half with nine points in the half and Smith had six. Cleare finished the game 5-for-10 from the field and now has 1,004 career points and 908 rebounds on her career. Smith finished with 14 points on 7-for-13 shooting and Desrats had 12 points, three assists and three rebounds. Pace chipped in 11 points, Annie Keenan had a game-high eight rebounds and Gritsko had a game-high three steals. Dahlke led the way for the Mariners with 14 points, including four three-pointers, and D’Arcy added 12 points and game-high five assists. Lauren Hunter finished with a team-high seven rebounds. The Knights finished the game outshooting the Mariners on a slim margin of 37.7-percent to 37.0-percent. The Mount converted 10 second chance points and outscored USMMA 28-8 in points in the paint. The Knights grabbed 15 offensive rebounds and outrebounded the Mariners 37-32. The victory pushes Mount Saint Mary to 12-4 overall and 9-0 in conference, standing alone with the top record in the Skyline.